Uncertainties you'll face in 2017 include reformulating for 2018 label changes, looking for growth and any changes implemented by the new commander in chief. This year, perhaps for the first time in history, the fortunes of the U.S. food and beverage industry may depend upon the president of the United States. There is as much uncertainty as there is optimism in the inauguration of Donald Trump as the 45th chief executive. On the positive side, will he loosen various regulations, dial back the FDA and overall cultivate a pro-business climate? Or will his critical statements about free trade harm the export-heavy food industry? Will his stance on immigration drive up labor costs and create job shortages? Could he create a climate for unsafe foods? Tangentially, will any company that criticizes his initiatives or supports liberal causes face a boycott from his very vocal supporters, Breitbart.com at the forefront? When we surveyed our Editorial Advisory Board about their outlook for the new year, with no prompting from us most mentioned the new administration. "What effect will the Trump administration have on USDA/FDA? And thus the food industry?" asked one of our board members. "Although he may have bigger agencies to go after." "Certainly the incoming administration has to be potentially the biggest scary/disruptive thing on the horizon – such an unknown," said a second. "After the election, the country isn't merely polarized, it is affectively polarized: a social science term meaning people don't merely disagree with each other (opposing views). They now actively dislike each other. This sentiment exceeds discrimination of race or religion. This self expression has given rise to more boycotting and protests and we see this in branded products, e.g. : Kellogg's Frosted Flakes [or all of PepsiCo]. Look at web sites and see products as being identified as liberal vs. conservative for no logical reason." Will some regulations be targeted for repeal or significant decrease in enforcement, such as menu labeling? Will upcoming compliance dates be further extended? Will there be efforts to repeal right-to-know laws such as GMO labeling as burdensome to industry without a commensurate public health benefit? The pendulum may swing more in the direction of commercial free speech with respect to health-related claims for products, even if there is just preliminary evidence in support of a structure/function claim. A lot will depend on which Donald Trump takes the oath of office on Jan. 20: the candidate who promised to "drain the swamp" in Washington and scale back the size and reach of government, or the post-election president-elect who made conciliatory and reassuring remarks that there would be at least some continuity. One thing is certain, or at least obvious: Trump is a businessman, not a career politician, and his most consistent statements have been about improving the business climate in this country. That should bode well for all companies. Big government and burdensome regulations are one thing (two things? ), but food safety is quite another. Even a presidential change-agent must be wary of creating a situation that could kill people. Assuming the new president doesn't effect some of the changes discussed above, the food & beverage industry will spend 2017 preparing for regulatory changes that will take effect in 2018. 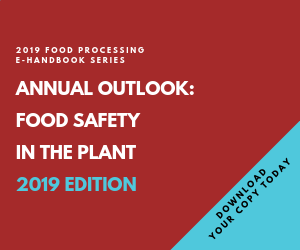 Next year will see three very big ingredient and labeling-related related changes that need to be worked on this year. GMO labeling is one of the most polarizing issues ever to affect the industry. Big Food hates the idea; Little Food loves it. The consuming public appears to be about evenly divided on the issue. When Congress and federal agencies couldn't come up with a labeling plan, a handful of states, with Vermont in the lead, took the initiative. The Vermont legislature passed a law in 2013 that required labeling by July 2016, with several adjoining states planning to join in. Congress used that as a deadline to create a compromise, mandatory (although with options), national law that would pre-empt Vermont's and any other state laws. Under the National Bioengineered Food Disclosure Standard, food and beverage companies can select from among three options: add "contains genetically modified organisms" to their labels, use a GMO label to be created by USDA or use the SmartLabel QR code, which the food industry itself created. Those are the Congressional mandates, but USDA and its Agricultural Marketing Service -- not FDA, somewhat surprisingly – is charged with fleshing-out the program. The Dept. of Agriculture has two years from the signing (presumably July 29, 2018) to enact the program. Perhaps we'll see a prototype of that national GMO label this year. Another July 2018 deadline is enforcement of a new Nutrition Facts panel. The FDA worked on the revisions for about a year before finalizing them this past summer. Highlights are a new "added sugars" line, larger serving sizes and the removal of “calories from fat” in recognition that some fats are healthy. Having added sugars called out should be particularly embarrassing for some processors, so many will spend 2017 modifying taste in other ways with less sugar or experimenting with non-nutritive sweeteners, most likely natural ones such as stevia and monk fruit. Vitamin D and potassium also will be required on the label. Calcium and iron will continue to be required. But vitamins A and C will no longer be required, although they can be included on a voluntary basis. Daily values for nutrients like sodium, dietary fiber and vitamin D are being updated. Speaking of trans fat, it was in the summer of 2015 that FDA announced an expected phase-out of that ingredient and its precursor, partially hydrogenated oils (PHOs). [Technically, the agency revoked the generally recognized as safe (GRAS) status of PHOs]. Food manufacturers were given three years (another summer 2018 deadline) to remove PHOs from products. Hydrogenation helps to solidify or stabilize a liquid vegetable oil. Hydrogenated oils produce the crisp, dry texture of a good french fry, the glaze on laminated doughs, the crispness in cookies and the savored qualities in hundreds of other favorite foods. While they were created as an apparently healthier substitute for saturated fats, decades of scientific evidence showed PHOs were worse, both raising bad cholesterol levels and reducing good cholesterol. While there's no 2017 deadline for this one, it's a huge issue the bigger companies in the food & beverage industry must deal with sooner or later (or else): Where is the sales growth? At last February's Consumer Analysts Group of New York (CAGNY) meetings, the CEOs and CFOs of Coca-Cola, General Mills, Hormel, Kellogg, Mondelez and PepsiCo announced or forecast lower sales but marginally higher profits – the latter the result of cost-cutting. And all of those firms made acquisitions in the previous year. How long can they manage to turn lower sales into higher profits? Our February cover story, "Little Food Ascendant," added Kraft and Heinz separately, Unilever, Maple Leaf and MolsonCoors to that list, while the likes of Enjoy Life Foods, Califia Farms, Renfro Foods, Stemmler Foods, Sonoma Foods and others grew at the expense of the big companies. That report looked at 2014 sales of our Top 100© companies and found aggregate sales had declined more than $1.7 billion, or 2.2 percent. Guess where they went. Overseas markets are no longer the pot of gold. "The world has been and is a volatile place," PepsiCo Chairman/CEO Indra Nooyi said at the CAGNY meeting. "We have encountered economic slowdowns, currency devaluations, geopolitical instability, increased regulatory pressure exacerbated by financial market volatility." Net revenues and profits were down in all three of her company's international segments in 2015. It was the same story at Coca-Cola. And at General Mills, which sold off businesses in Venezuela and Argentina. Stagnation is behind such business-related changes as Conagra Brands (note the new name) starting life half the size of ConAgra Foods … and Hostess returning to the public stock market at half its former size … AB InBev swallowing up SABMiller … Kraft and Heinz, two venerable 100-year-old companies, tying the knot in 2015 … and Tyson Foods becoming the largest North American food processor (by our Top 100© math) by virtue of its acquisition of Hillshire Brands. Who will be the big names acquired this year? But also, who are the small entrepreneurial firms that are capturing the hearts and wallets of millennials? And who may well be bought up by the big firms trying to stay relevant. Other issues to look out for this year include governmental taxes on sugar (in Berkeley, Calif., Philadelphia and Chicago), with other entities looking at taxing salt and fat. The continuing rollout of the Food Safety Modernization Act. The continued growth of nontraditional sales channels, especially e-commerce. And if you're in the non-milk milk business (soy milk, etc. ), the dairy industry and now several Congressmen have you in their sights this year. 2017 should be an interesting and challenging year for all. We hope you're still around to read our 2018 outlook. Invest in GMO labeling, not home delivery meal kits, plus five other suggestions for 2018. Increase sales, not just profits, in 2017. U.K.-based firm identifies what's trending for new products this year. The Food Safety Modernization Act, GMO labeling and other issues made 2016 a landmark year.